Comments: Thomas Ellison Bruce was born on February 4, 1887, and raised in the Branchville area of Orangeburg Co., S.C. He was called by his middle name, Ellison, which he shared with his maternal grandfather, Dr. Ellison Connor of Orangeburg Co. Ellison was the eldest child of Charles Leroy Bruce and Emily Jane (Connor) Bruce. His father was a small-time farmer and rural mail carrier. At some point in Ellison's youth, the Bruce family left the farm and moved into the small town of Branchville. Emily Bruce owned and operated a successful boarding house/hotel there, which provided the family's main financial support. Her hotel catered to the many railway workers in the vicinity due to the presence of a large railroad transfer and repair station for several railroads. As a child, Ellison often accompanied his grandfather on his medical house calls and became interested in medicine at an early age. When Ellison graduated from Branchville High School in 1906, he entered pharmacy school at the Medical College of Virginia. At the time, no pharmacy school existed in South Carolina, and it is probable that Ellison received financial assistance for his Richmond schooling from his grandfather or a maternal uncle, who was a pharmacist. 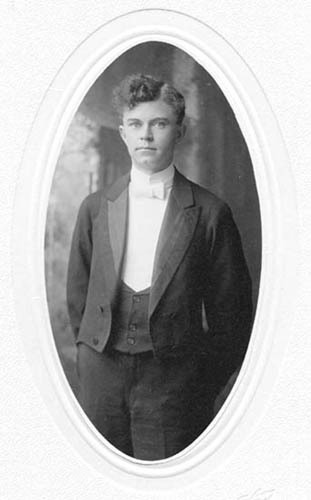 Ellison completed the required two year course for a pharmacy degree in June 1908. After graduation, Ellison went to work at a drug store in Newport News, Virginia. About a year later, he answered a newspaper ad seeking a druggist to work in a Scottsville drug store owned by Dr. Benjamin Dillard and Dr. Luther Stinson. Ellison went to work for them at the Scottsville Drug Company sometime in 1909. A shrewd businessman, Ellison soon owned the drug company which kept the same name, although it was informally known as 'Bruce's Drug Store.' In the 1920's, the name of Ellison's drug store business became formally known as Bruce's Drug Store. Ellison quickly became a part of the Scottsville young people's social set, participating in play productions at Moore's Hall and attending picnics and camping trips arranged by Sam Gault, the Scottsville postmaster. During an August 1911 camping trip to Schuyler, Ellison became quite enamored with Mary Estes Browne, a young teacher at Scottsville School. 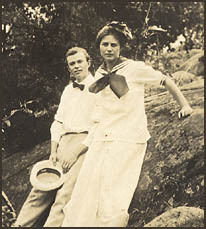 Ellison and Mary are shown in the camp photo at right, and after their camping group returned to Scottsville, they began a long courtship that would culminate in their 1915 marriage. Mary Estes Brown was born March 21, 1890, at Cascade, Pittsylvania County, Virginia. Mary was the eldest child in a family of seven children born to Reverend Henry James and Mary Rebecca (Gunn) Browne. 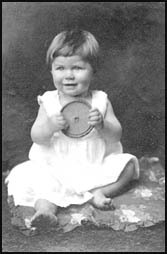 She was named after her mother, Mary, and the Dr. Estes, who had delivered her at birth. Mary's father was a Methodist minister serving a congregation at Cascade at the time of her birth. As the Methodist church requires their ministers to move at least every four years, Mary grew up in the following small, rural Virginian communities: Cascade (1890-1893); Lillian, Northumberland Co. (1893-1896); Glendale, Henrico Co. (1896-1899); Coman's Well, Sussex Co. (1899-1903); Flint Hill, Rappahannock Co. (1903-1907); Scottsville, Albemarle Co. (1907-1911); and Palmyra, Fluvanna Co. (1911-1915. 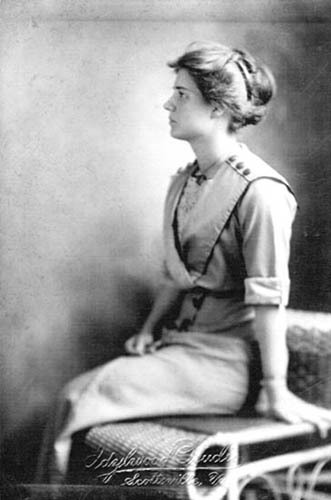 Mary was educated in public schools except for two years at Blue Ridge Institute in Flint Hill, a private day school where she received her high school diploma in 1906. Mary graduated in 1909 from Blackstone Female Institute, a two year Methodist college in Blackstone, Virginia, and began her teaching career in Scottsville. She taught a one-room combination of the first and second grades and lived with her parents at the Methodist parsonage. 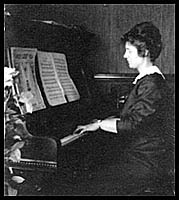 In 1910, Mary attended summer school at the University of Virginia. Reverend Browne was transferred to the Palmyra Methodist Church ministry in 1911. Mary continued teaching in Scottsville and lived during the school term at Belle Haven, the home of Captain and Mrs. John Lee Pitts. Mrs. Pitts was a close friend of Mary's mother, and the Pitts family generously provided Mary with a home at no cost. Mary spent weekends and vacations with her parents at Palmyra, which was about twenty-five miles from Scottsville by train or car. After Ellison fell in love with Mary at the August 1911 camp out near Schuyler, the two began a courtship that spanned four years. Ellison and Mary wrote each other often and saved their letters. In 1986, their daughter, Rebecca Jane, transcribed ninety-eight of her parents' courtship letters, and copies are now available at Scottsville Library and Scottsville Museum. These letters provide a colorful glimpse of small town life in the 1911-1915 time frame and an intimate, poignant glimpse into the lives of Mary Browne and Ellison Bruce. On October 14, 1915, Ellison and Mary were married at the Methodist Episcopal Church of Palmyra by Reverend Browne, Mary's father. Her brother, Edwin Browne, escorted Mary to the altar where she was attended by Anne Browne, her sister, and Virginia Pitts, a dear Scottsville friend. Lee Bruce served as his brother's best man. After their honeymoon, Ellison and Mary resided at their first home, the Cottage at Belle Haven. In 1919, the Bruces purchased the Jefferies home on Harrison Street, which became their permanent home in Scottsville. Ellison Bruce was a popular and successful businessman in Scottsville. Besides his drug store business, Ellison joined with two partners and opened the Scottsville Furniture Company. After a few years, he sold his interest in that business. In 1914, Ellison and Gordon White began the White-Bruce Motor Company on Valley Street, which sold Fords and flourished for many years. Ellison remained a partner in this business until his death. 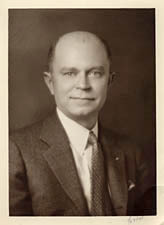 Ellison served as a four-time mayor of Scottsville from 1935-1943. In 1943, Albemarle County voters elected Ellison to the first of two terms he served on the Albemarle County Board of Supervisors from Scottsville District. He also was a member of the Scottsville Chamber of Commerce, the Scottsville Lions Club, the Scottsville Masonic Lodge No. 45, and the Scottsville Methodist Church. Ellison was stricken by a heart attack at his drug store and died unexpectedly on November 25, 1947; he is buried in the Scottsville Cemetery. Mary Bruce was very active in the Scottsville Methodist Church and served as its organist and choir director for many years. She also was an avid gardener and a civic leader in the Town of Scottsville and in Scottsville Schools. Mary died on June 30, 1955, in Scottsville and is buried beside her husband in the Scottsville Cemetery. 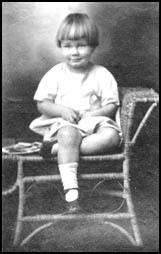 (1) Rebecca Jane Bruce (1917-1999): Jane was born on June 15, 1918, at the Cottage on Belle Haven in Scottsville, and attended Scottsville Schools. She graduated from Scottsville High School and attended Randolph Macon Woman's College in Lynchburg, VA. Jane transferred and graduated from the Richmond Professional Institute (the Richmond Division of the College of William and Mary; now Virginia Commonwealth University in 2004) with AB and MA degrees in social work. Jane was first employed in Rockbridge County, VA, and then in a New York private adoption agency, where she became a specialist in adoption. She married John Zambuto on November 11, 1960, at Scottsville Methodist Church, but they later divorced. Jane returned to Virginia in 1969 to work as assistant head of Social Services, University of Virginia Hospital in Charlottesville. She lived in Charlottesville and was skilled as a writer of poetry and prose; loved fine cooking, art, and music; and was an avid traveler. Rebecca Jane (Bruce) Zambuto died on November 19, 1999, in Charlottesville, VA, and is buried in the Bruce family section of the Scottsville Cemetery. (2) Thomas E. Bruce, Jr. (1919-1998): Tom was born on May 8, 1919, at the Cottage on Belle Haven in Scottsville, and attended Scottsville schools. After graduating from Scottsville High School, he enrolled at Washington and Lee University, Lexington, VA, and graduated with a bachelor's degree in accounting. Tom was working as an accountant when his father unexpectedly died of a heart attack in 1947. He took over ownership and management of his father's business, Bruce's Drug Store, and also acquired a degree in pharmacy at the Medical College of Virginia. Tom was active in Scottsville community affairs, serving as a Town Councilman and in 1953, he was elected Mayor of Scottsville. He married Martha (Kent) Carter in Luray, Virginia, and they raised her son, Kent Carter. After almost thirty years operating Bruce's Drug Store, Tom retired and sold the business to Richard and Ann Sago on April 1, 1977. Tom continued to live in Scottsville until his death on April 22, 1998, in Charlottesville, VA; he is buried beside his wife, Martha, in the Bruce family section of Scottsville Cemetery. (3) Anne Shirley Bruce (1920-2014): Anne Shirley was born on November 6, 1920, at the Jefferies-Bruce house in Scottsville. She attended Scottsville schools through high school and graduated from Randolph Macon Woman's College in 1941. On October 14, 1941, Anne Shirley married Lindsay Gordon Dorrier (1919-1996), the son of Charles Richard and Clara Lee (Pitts) Dorrier of Scottsville. The Dorriers became the parents of four children that they raised at Endfield, their farm near Scottsville: Lindsay Gordon Dorrier, Jr. (1943); Claire Pitts Dorrier (1945); Ellison Bruce Dorrier (1948); and Richard Thornton Dorrier (1951). Anne Shirley began teaching fifth grade in 1959 at Belfield School, a K-8 private school in Charlottesville, and earned a Master's Degree in Education from the University of Virginia in 1960. In the early 1970's, Anne Shirley assumed the position of Administrator of Grades K-5 at Belfield School for five years. In 1975, Belfield was merged with St. Anne's School and renamed St. Anne's-Belfield, and Anne Shirley returned to the teaching she loved as a fourth grade teacher. Anne Shirley retired from teaching in 1979 and retired to the farm where she and her husband began to raise chardonnay grapes. They developed a small vineyard which they tended for nearly fifteen years, and they supported the efforts of other local vintners in developing the wine industry in Virginia. Anne Shirley worked as a volunteer at the Scottsville Museum for many years and was a member of the Southside Alliance, an interracial group founded during the 1960's whose mission was to promote diversity and friendship. She also was one of the early members of the Tri-County Riding Club and encouraged the riding and social activities of the club as the club grew and developed. She worked as a volunteer for many years for the James Madison Library both in Scottsville and Charlottesville, serving on the Board of the Library. Anne Shirley was also a member of the Virginia Creepers, the Contemporary Club of Albemarle, and the Albemarle Pippins. She was a dedicated fisherman, an avid tennis player, a devoted gardener, an enthusiastic ocean swimmer, a passionate music lover, and an excellent cook. On 11 October 2014, Anne Shirley passed away at her Endfield farm, and she is buried next to her husband, Lindsay, at the cemetery of Christ Christ Church, Glendower, in Keene, VA. These photos are part of the Anne Shirley (Bruce) Dorrier collection. 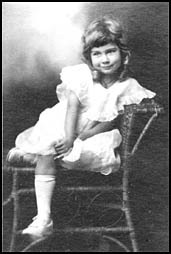 Anne Shirley resided in Scottsville until her passing in 2014 and was the daughter of Thomas Ellison and Mary Estes (Browne) Bruce.